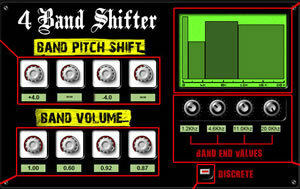 4 Band Shifter, Pitch Shifter / Time Stretcher from Bitterspring. 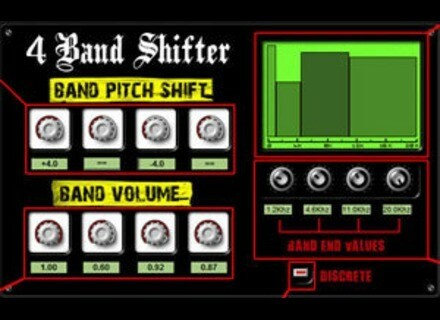 Jane's Conference / Bitterspring has released 4 Band Shifter, a free open source VST effect plug-in for Windows that is able to shift independently the pitch of 4 adjacent, user-definable frequency bands. Code is based on Stephan M. Bernsee's article, Pitch Shifting Using Fourier Transform. Fast: it uses FFTW library to perform fast STFTs. Can shift each frequency band independently in a range of (-12, +12) semitones. Big display representing the frequency bands / gain per band / volume per band. Can work in continuous or discrete mode. WOK XPhaser WOK has announced the release of XPhaser, a new dual phaser VST effect plug-in for Windows. Korg Updates iElectribe for iPad This update (1.1.0) is designed to add the ability to transfer audio from the iElectribe app into a MAC or PC via iTunes, using CD quality wav files. MZK Media Technologies Distortion M Plus MZK Media Technologies has announced the release of Distortion M Plus, a free multiband distortion plug-in system for Windows.